A book that celebrates spices, and the integral ways in which they shape what we eat. Throughout a career spanning thirty years, well-known food critic and writer (and little-known collector of spice-grinders of eclectic origin), Marryam H. Reshii has had a relentless love affair with spices. Such has been her passion that she has travelled across the country and to various corners of the world – crushing, grinding, frying and tasting – in a bid to understand every aspect of these magnificent ingredients. The result is The Flavour of Spice, a zesty narrative that brings together stories about the origins of spices and how they evolved in the cuisines we know and love; colourful anecdotes gleaned from encounters with plantation owners and spice merchants; and beloved family recipes from chefs and home cooks. From the market yards of Guntur, India’s chilli capital, to the foothills of Sri Lanka in search of ‘true’ cinnamon, and from the hillsides of Sikkim where black cardamom thrives to the saffron markets in the holy city of Mashhad, Iran – this heady account pulsates with exciting tales of travel and discovery, and an infectious love for the ingredients that add so much punch to our cuisines. Celebrating spices in all its glory, noted food writer Marryam H Reshi in her book, ‘The Flavour of Spice’ embarks upon a delightful journey tracing their history as far back as possible. Travelling across the globe, chasing lab experts, getting held at airports for carrying too many stashes of spice to forcing her friends into getting her samples from abroad, this book is a delectable collection of anecdotes that Marryam has picked up in her long and wide food journey. Marryam is a deft storyteller. Her passion and knowledge of the subject is evident as you read ‘the flavor of spice’. The stories, the recipes, the masterful yet deliberate use of the language leave one feeling a delightful mix of satiated yet hungry. A must read, not only for the knowledge contained therein but for sheer enjoyment of the written word. I have always said that Marryam’s disarmingly innocent questions will make even the most guarded cook spill their secrets. And those she stores away into her encyclopaedia of a brain. When it comes to Indian food, Marryam is the one to turn to. With this book, Marryam leads you into a visceral spice journey. From the most obvious streets of Khari Boali in Old Delhi and the Lalbaug Spice market in Mumbai to every little nook and alley in the country. Marryam has delved into the world of Indian spices and broight fragrance to each page with painstaking detail. My favourite chapter is the one on Hing. I had no clue that asafoetida was 1. a resin b. not grown in India but in Afghanistan (considering how liberal every Indian kitchen is in using it) 3. has grades, the most expensive of which costs over 12k a kilo. Whichever way you look at it, if you are a food lover, this book is for you! I am surprised food groups rarely if ever get posts on recipe books, food history books or any other food related books which are so essential to the life of a foodie. Yet so many have told me about how useful cookbooks are in their life – Takshashila Desai of Tandoorworkz told me about a particular recipe book that gave her crack recipes. I am a voracious reader of books, fiction, non-fiction, informative, reference and even encyclopedias, covering almost every subject – and I have written books and articles on diverse subjects. I bought this book because it is written by Marryam H Reshii whose reviews I follow when visiting Delhi, wondering what to expect – food history, travelogues, information, reference, perspectives or recipes. It turned out to have The Full Monty! Everything that to me constitutes a good food book are part of this work, which is written in jargon free language – interesting, informative and easy reading. Those who like history and fascinating facts, will love this book. It talks about the history of each spice/spice group from origin to its spread and use. Some of the trivia really entertains and surprises. For instance, the Dutch to establish their monopoly on spice trade out of the Banda Islands of Indonesia, not only killed many natives and successfully fought other rival colonial powers but took Run Island from the British in return giving them, hold your breath, Manhattan. They must be kicking themselves now! The travelogues of the author also make interesting reading, bringing alive farms, markets, shops, processing factories and kitchens. When writing about coriander for example she talks about visits to Bhopal and its nearby fields, Lucknow’s spice market, Srinagar’s old city and Shimla. She meets people and talks to them, sometimes bringing out interesting, useful or amusing information. She laughs at herself in an anecdote about a visit to Philip Kutty’s farm where her visible excitement on seeing the black pepper gets gazed at in astonishment by the owners of this famous farm homestay in Kumarakom. Closer to our home, on her visit to Unjha, she describes the smells of Cumin and the cumin processing industry. She talks about the difference between the chillies in Valancia where the chillies are so mild you won’t cought or sneeze, compared to the market in Bangkok where freshly ground chillies make you sneeze away. Besides the author’s first person narratives she also includes anecdotes and tales told to her by others. Like the Mexican in the Indian spice market – the shop owner gives him the hottest Guntur chilly to try, thinking the firang will be laid low, but the Mexican eats it comfortably. He gives the habanero to the trader, and sees the face when he tastes one of the world’s hottest chili! If you are interested in knowing more about spices, this is the book for you. Divided into the BIG FOUR, AROMATICS and SEED SPICES, each chapter goes into details about the different varietals – taste, colour and so forth. From microbiologists to chefs to traders, many expert views are expressed in this book. Through spices, Reshii describes each cuisine and how specific spices are used differently in each region or by different communities. She also talks about spice grinders and spice mixes. If you cook, this book has many recipes by chefs and others that you can use. She brings up many relevant points in the book. For example, she says that while other communities like the Mexicans use chillies for flavor, Indians are often only interested in using chillies for heat. She writes, “if you don’t have Karnataka’s kundapuri chillies, you would happily use Kashmir’s pampori ones’’. Do our Kathiawadi places use chillies from Saurashtra, I never bothered to check when reviewing them! When you ask a restaurant to describe a dish, they classify it as Red Gravy, Brown Gravy, White Gravy, Green Gravy. White gravy is usually considered non-spicy, but Reshii points to the yellow meen moilee, the pale coloured fish caldine, the doi maach, the dabba gosht and the white Kashmiri mutton yakhni which use chillies too. Certainly a book worth reading. By Anil Mulchandani, Food Writer and Times of India Restaurant Critic, Ahmedabad. Perhaps the most unnerving thing that I notice with much of Indian cooking; commercial Indian cooking anyway, is the non judicious and somewhat mindless use of spice and its blends. Much of it attributable to the sheer ignorance or understanding of how such gems of ingredients have elevated food for millennia, and shaped history as we know it… through, but not limited to confluences, geography, science and of course cultural pluralism. The magic masala mix has successfully been the largest driver of a cuisine monocultural trend; where place after place is basically identical in flavour profiles; and high on its claims of being unique. What started as convenience, becomes so ubiquitous, that a generation from now, it’ll become part of the recipe roster – like the back of a Maggie packet. I can’t begin to stress how important it was for someone to put all this into perspective, a task that couldn’t have been an easy one. Along came The Flavour of Spice, a work that quite clearly has been years in the making. A work that couldn’t have been possible without decades of experience, research, conversations and study. A work that embodies what food writing should have been all along, before it turned into a churn of book after senseless book jostling for space at already crowded bookshelves with fifty recipes for five minute chicken for bachelors… you get the drift. The tale of a Bhopali version of chicken Rezala explains what coriander can do for the digestive system, especially when in an area known for poor quality water. Why the saffron trade is as fraught with fakes and mislabelling as the olive oil business is; and how once you’ve experienced the real deal, which is one of the most painstakingly difficult spices to harvest, there’s no going back. How ironically mustard seeds, in its different avatars are so beloved in Bengal, yet the leaves are consumed as a ‘North Indian’ treat in winter. Similarly in the Salem, Coimbatore, Erode belt – made as famous by the madras checks as it is by its superior quality turmeric; the author finds that the leaves, so precious in some other cuisines are all but missing from their repertoire. There’s no absolutes with how food has evolved; and one mans treasure is another’s leaf. It’s the backbone of understanding cuisines and appreciating how magic is born, often, through restraint. A brilliantly pieced together book, which showcases recipes collected over the years, the medicinal benefits that spices have been treasured for, the very source they come from and the cuisines of those lands, and how we’re all faintly related in our food cultures sometimes. More than we’d ever imagined. Without giving too much away, I do feel that this should be compulsory reading for anyone who wants to either write on food, or cook it. It makes a pressing case for being a textbook, for anyone keen to enter the world of food and hospitality. It’s a MUST read for those who enjoy a well researched and well written body of work, which manoeuvres a unique style with cultural and historical narrative, oodles of perspective and wit to boot. Perhaps my only gripe is that this could’ve easily been a coffee table book – but for now, one will have to settle at conjuring these stunning images in their minds. Well done Marryam, can’t wait for the next! Took my time reading and reviewing this because, like a good spice tempering, this one needs to be savoured. Nurtured over years, brilliantly researched, hugely knowledgeable, yet written with humour and accessible to the common reader, this book really raises the bar for food writing in India. We have a significant lineage of recipe books and food-based memoirs but there’s a huge dearth of books that approach food with a questioning eye, with curiosity and a willingness to learn, twinned with a lifetime’s devotion to the larger subject. This is that book. If you’re even the least bit interested in what you eat, pick this one up, you won’t regret it. The author is a senior food writer in the English language media in India, and I know her through her writings and on social media. If there is one book on food that you absolutely must own, it is this: Marryam H Reshi’s The Flavour of Spice. The book is clearly reflective of the amount of time, dedication, and love that Marryam has for the subject. A captivating narrative backed by serious academic research, folklore, and warm stories interspersed with recipes (from chefs, from her home, from friends’ homes), makes The Flavour of Spice a book that appeals to everyone, whether you want to cook from it or read it in the study. It is a fine example of food writing rooted in research yet writing that brings a diverse and complex subject riddled with historical misinterpretation into the everyday. I took my time reading the book over several weeks because it demands attention and reflection as Marryam holds your hand through what is a virtual journey across the country’s spice plantations and godowns. I have always admired Marryam as a senior food writer, and this book will show you why. I cannot emphasize enough how important it is for more and more of us to continue the conversation around Indian food, and celebrate the diverse regional cuisines and amazing array of indigenous ingredients that exists in our country. 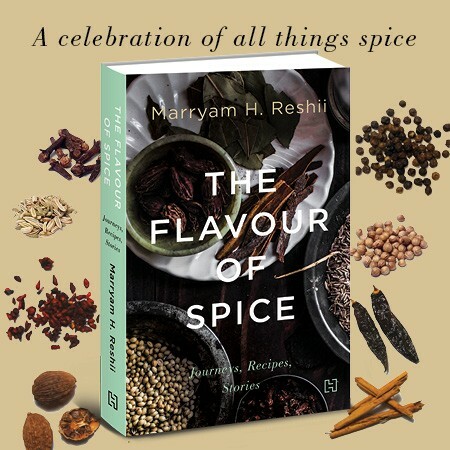 With her new book The Flavour of Spice, the wonderful Marryam H Reshii explores the incredible world of Indian spices and the integral ways in which they shape the way we eat. Must buy. I got this book just few days ago and it has been my companion since then. The Flavour Of Spice is not just a book about spices and their culinary uses but the beautiful narration brings forth the journeys of spice plantations, the traditions around their varied usage, the stories of wonderment and the mysteries around some of the uncommon spices. This will be one book that is going to be a must have for chefs, home cooks and everyone who craves for good stories.